Chief among the many adaptations of the bat for powered flight is the bat wing, and the flapping flight style that uses muscle power to generate lift and thrust. The bat wing evolved from the forelimbs of a terrestrial mammalian ancestor. The mammalian forelimb is exceedingly mobile because the shoulder joint between the scapula (shoulder bone) and the humerus (upper forelimb bone) is loosely held together with muscles. This allows for actual rotation of the arm around the shoulder joint in many species. Primates have this mobility, and so do bats. The taxonomic name of the bats, order Chiroptera (meaning, "hand-wing"), perfectly describes the morphology of the bat wing. The skeletal structure of the bat wing consists of the humerus, a well-developed radius, and a much-reduced ulna. In humans, the ulna is a major bone of the forearm and forms a hinge joint in the elbow region with the humerus. The highly elongated hand (metacarpal) and finger (phalanges) bones form the rest of the bat wing skeleton. Only the pollex (or thumb) retains the claw of the mammal ancestor, although on fruit bats and flying foxes the second digit also retains a claw. The bones of the wing provide a segmented skeletal frame for support and control of the flight membrane. The flight membrane (called a patagium) is a flexible double-layered structure consisting of skin, muscle, and connective tissue. It is richly supplied with blood vessels. The region of the patagium that stretches from the sides of the body and the hind limbs to the arm and the fifth digit is called the pla-giopatagium. 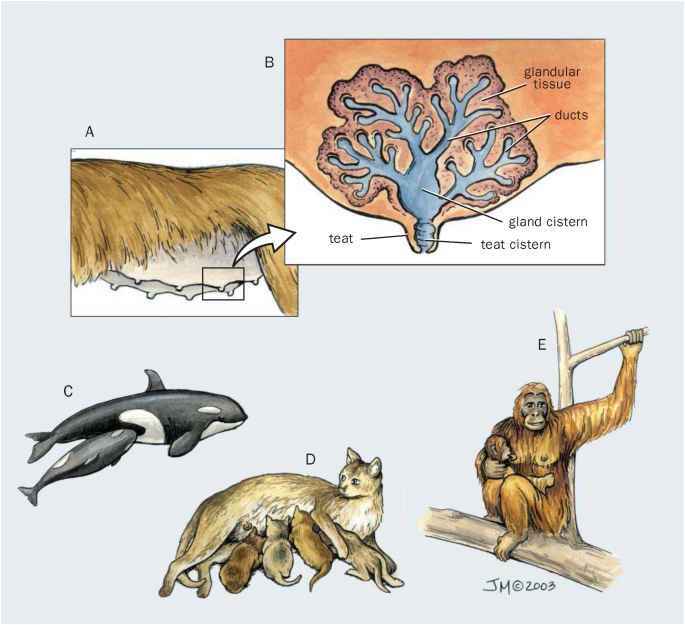 Other portions of membrane extend from the shoulder to the pollex (first digit) along the anterior portion of the wing (propatagium), between the fingers (the chi-ropatagium), and from the hind limbs to the tail (the uropatagium, also called the interfemoral membrane). The wing operates on an airfoil design, with the flexible membrane segments changing shape to produce variable pressure gradients along the wing surface that results in variable amounts of lift and thrust. The bats' fine control of the shape of the patagium gives them a maneuverability that cannot be matched by birds. Bat flight is controlled by seventeen different pairs of muscles. Three different muscles provide power for the down-stroke. Another three muscles execute the upstroke. This is very unlike birds, where two pairs of muscles provide the power for the depression and elevation of the wings. The sternum (breastbone) in bats is not particularly well developed, while in birds it is very prominent with a well-developed keel. The pectoralis muscle that originates from the sternum is the largest bat flight muscle and it has the richest supply of blood vessels known for any mammal. Other muscles that originate from along the vertebral column (backbone) and the scapula help to provide tension to the membrane and adjust the position of the wing. Muscles fibers embedded in the membrane assist in regulation of the tension of the patagium. Many muscles that exist in terrestrial mammals have been slightly repositioned, while others unique to bats assist in keeping the patagium taut. The wing operates on an airfoil design, with the flexible patagium segments changing shape to provide variable amounts of lift and thrust. The hind limb possesses a bony spur unique to bats called a calcar that projects inwardly from the tibia. This bone attaches to the uropatagium and functions to keeps the tail portion from flapping during flight. The legs can also form a pouch out of the uropatagium used for catching insects. In most bats, the hind limbs have rotated 90° outwardly and assumed a reptilian-like position. The legs are used to control the uropatagium during flight. Another important adaptation of the hind legs is as a hook, an adaptation for hanging upside down. Bats are able to hook the claws of their hind paws onto horizontal supports or rough edges on walls or on ceilings of caves. The claws have developed a locking mechanism that allows them to hold without any muscular involvement. Hanging upside down allows bats to occupy areas unavailable to birds and allows a bat to use gravity to initiate flight by dropping. It is often believed that bats are completely helpless on the ground because of the arrangement of their legs; this is not true. Some species hop while others move quadrupedally. If a bat falls in water, it can swim to land. However, they do not use these forms of locomotion habitually. The arrangement of the bat hind limbs has probably constrained the bat lineage to being flyers. There are no flightless bats nor are there swimming bats comparable to those found among the birds (e.g., ostriches and penguins, respectively).